This might be a record drop in dollar terms but not in percentage terms. Let's say I had invested $100 in the market and the market crashed 50%. I lost $50. Let's say that $50 went on to grow to $1,000, then fell by 10%. I lost $100. In absolute terms this was the worst loss I've ever experienced because I had never lost $100 before. In relative terms it was nowhere near as much as I lost last time. This might be the most points ever lost by the Dow Jones in a day, but the Dow Jones has also never been at such a high level before. This isn't to say the loss doesn't hurt, but it's important to step back and look at the loss from a different perspective. The last time the market was this low was.... Thanksgiving. As in, a couple months ago. How did you feel about the market then? What has changed since then? Your portfolio went up in value in January, then went down some more recently. This doesn't change your financial goals or your long-term plan. Prior to Friday, the S&P 500 had been within 3% of an all-time high for a record 202 days, which is almost twice the previous record (Source). You can't expect that to continue forever. The Dow Jones is just one part of the broader stock market. Hopefully you have heeded our advice to diversify and don't have your entire portfolio invested in the Dow Jones. A stock market correction of at least 10% happens, on average, once a year. The last time we saw such a drop was about a thousand days ago. The reason you earn a higher return in the stock market is because of this risk. We can speculate on the causes of the recent selloff in the market. The jobs report on Friday showed rising wages, which could hurt corporate profits. There is evidence that inflation is picking up. Interest rates are rising faster than anticipated. Higher yields might be drawing investors away from stocks. The truth is we never know exactly what causes the markets to rise or fall in the short-term, even though we feel we need to find a narrative to fit what's happening. 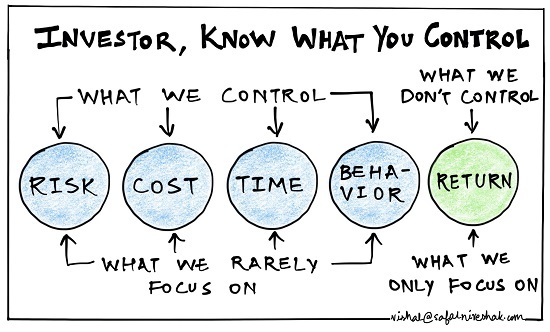 Instead of worrying about what caused the markets to rise or fall, focus on what you can control. And ignore the misleading news.